The ABII is the flagship of the Afterburner line. It features a semi-hollow walnut body with an exhibition grade walnut top. The tone is rich and full with an acoustic-like “air” to the note. *Available in 4, 5 and 6 string models. Walnut sounds very similar to Alder, but with more clarity, sustain and punch. We reduce the weight and increase the resonance by adding strategic tone chambers throughout the body. The Afterburner II is the flagship of the Afterburner series. It has the tone and performance of a boutique instrument at an affordable price. Internal tone chambers enhance the acoustic resonance for a richer tone. The average weight of an Afterburner II is a low 8.75 lbs. We use a special polyester that’s been formulated for electric guitars. It not only looks great, but it sounds great too. The bodies almost look like they’ve been dipped in glass, yet the finish is extremely thin allowing it to be acoustically transparent. Most Afterburner II basses are finished in Natural to highlight the wood. However we have a huge range of available colors. Please refer to our photo galleries and price list for available colors and styles. 5-piece laminated maple - Wenge optional. We take neck construction very seriously due to our extensive experience in guitar repairs coupled with our geographic location and corresponding extreme climate. In my years in the guitar repair business I constantly had to deal with humidity related problems made worse by the huge temperature and humidity swings of our local climate. Many of these problems could have been minimized through simple design changes and materials choices. We’ve experimented with many different laminations and have found a 5-piece maple construction to be among the most reliable. Years of experience have proven this design to be extremely stable and reliable. We offer a 5 piece laminated wenge neck as an option. Wenge is also very stable. A wenge neck will be roughly 50 grams heavier than maple with an open grain feel. The tone is similar to maple but with a slightly snappier response. The double expanding truss-rod style is one of the industry standards. However, our method of installation – taught to us by Glenn McDougall of Fury Guitars, involves gluing the truss rod into the neck under almost 1000-LB of pressure. This creates a coupling of steel to wood increasing both sustain and harmonic content. The truss rod is the most commonly adjusted component on most guitars, so access to the truss rod adjustment should be as easy as possible. All Dingwall basses feature easy to access truss-rod adjustments. We install dual carbon fiber reinforcements in Walnut Afterburner II necks. This stiffens the Walnut and also increases sustain and clarity. Headstock design – Flat, counter bored. The design goal was to utilize a flat headstock design. Materials and labor savings are significant with this design. The only problem was that a flat headstock needs a string tree to create proper downward angle at the nut. It took some creative thinking and custom made tuners to solve this problem in the most elegant way possible. The headstock features special counter bores that when combined with our custom tuners allows proper break angle at the nut. A side benefit is that these special made Hipshot Ultra-lites are even lighter than the originals. Combined with the minimalist Afterburner headstock shape, the improved balance is significant. Satin Blacked out Neck shaft, Head and Heel. Wenge is an interesting fretboard wood due to the alternating layers of hard and soft grain (early and late wood). The hard grain gives the tone a nice top end similar to ebony and the soft grain adds the warmth of Rosewood. It’s a great all around fingerboard wood. - We can have a very vintage feeling 7-1/2” radius at the nut for comfortable play in the lower frets. - We can also have a much flatter radius at the bridge to make play easier for the plucking hand. - The flatter radius at the bridge keeps the strings a more consistent distance from the pickups for more even response. Macassar Ebony with edge lines. 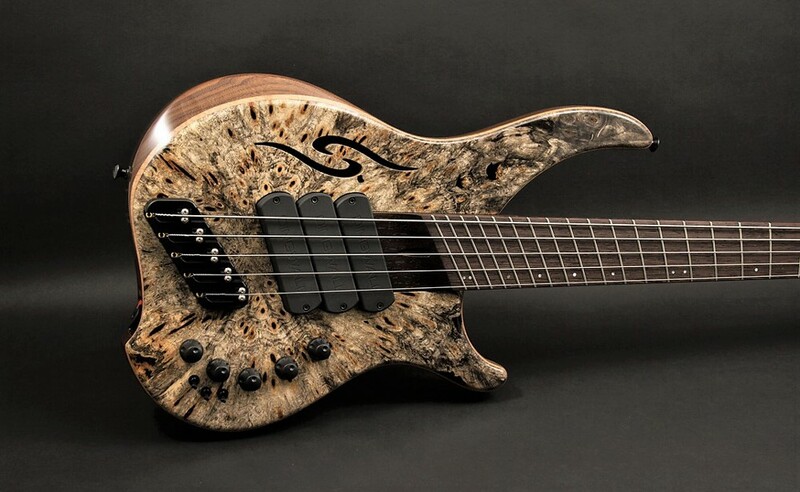 We prefer the warmth of tone and beautiful look of Macassar Ebony for a fretless fingerboard. To guaranty buzz-free performance regardless of temperature and humidity changes, we install short fretlines on the edge of the fingerboard only. Thereby eliminating any chance of buzzing caused by the fretlines shrinking or expanding from the fingerboard surface. Vintage small size 18% hard nickel silver fretwire. Lee Sklar turned us onto the benefits of small frets. The advantages are a more woody, less metallic tone, smoother glissandos and a faster feel. Our standard size is “banjo” size. This is the same size as you’d find on most guitars from the 50’s and 60’s. Although its size is smaller than standard bass fretwire, its service life is about the same. White or Black Pearloid side and face dots. Optional Pearloid or Black blocks. Speedo Bars. Passive FDV pickups, master volume, 4 position rotary pickup selector, master tone. Standard. FDV pickups are the standard pickup in our Afterburner II model. They are a continuation of the FD (Fury/Dingwall) line of pickups but feature Alnico V magnets instead of Neodymium. Their tone and response is the most traditional sounding and feeling of all our pickups yet they maintain the tightness and clarity that Dingwall basses are known for. They feature 4-lead wiring which enables the internal coils to be wired in either series for strong mids and high output or parallel for scooped mids and normal output. The pickup coils can be pre-wired in either series or parallel or can be run through a series/parallel toggle for on the fly tone shaping. Any of our FD size pickups can be fitted or retro-fitted into the current spec (Rounded end pickups). The available options include the P-tone, which gets you as close to the traditional P sound as possible, the FD3, for a slightly more hi-fi tone and greater sensitivity to dynamics or the Super-Fatty II, for a huge, fat bottom-end with a little bit of sparkle on top. The Afterburner II comes standard with 2 pickups in traditional spacing. The 3x option adds a middle pickup for even more tone options. 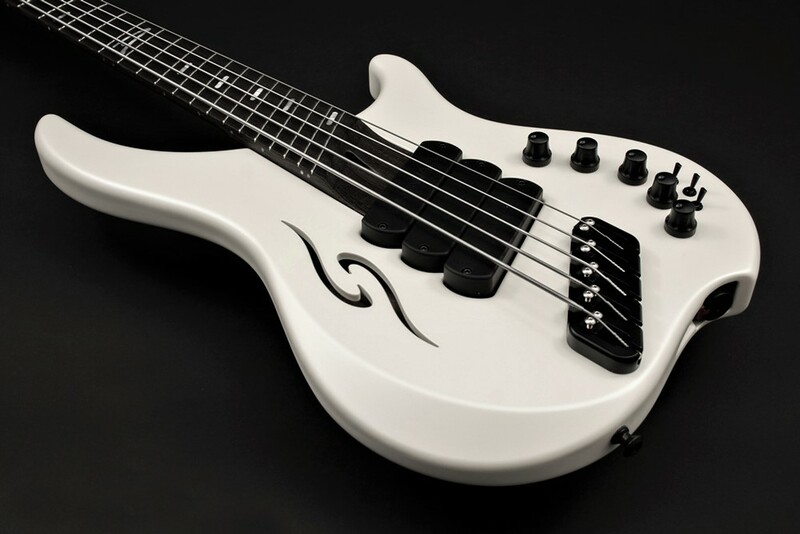 All Dingwall basses feature a 4-position rotary pickup selector. The rotary switch does two things. It reduces the load on the pickups compared to a standard blend control and it offers 4 distinct bass tones that are all very musically useful and versatile. The standard passive system is amazingly versatile. Even more so with the addition of series/parallel toggle switches. If you want even more tone shaping at your fingertips, we have two options of 3 band pre-amps. The Darkglass Tone Capsule and the Glockenklang 3-band. The Darkglass Tone Capsule has a rich, warm bass control that's voiced high enough to provide low, low mid shaping as well. The low-mid control is similar to the Glockenklang but the high-mid control is unique. Boosting it provides incredible cut that will grind it's way through any dense mix. Cutting it sounds reminicent to a vintage passive tone control except it retains a nice amount of sparkle on top. What we like about the Glockenklang pre-amps is the smooth and subtle tone shaping and the Active/Passive treble control. We’ve spent a lot of time perfecting the natural tone of our basses so that they don’t need a lot of tone adjustment. The Glockenklang really fits well with this philosophy. The Active treble boosts and cuts as expected in active mode but when the pre-amp is switched to passive mode, the control is switched to a passive cut control. This is essentially like having two basses with two distinct characters. One active and one passive. Darkglass Tone Capsule or Glockenklang 3-band. The Darkglass Tone Capsule has a rich, warm bass control that's voiced high enough to provide low, low mid shaping as well. The low-mid control is similar to the Glockenklang but the high-mid control is unique. Boosting it provides incredible cut that will grind it's way through any dense mix. Cutting it sounds reminicent to a vintage passive tone control except it retains a nice amount of sparkle on top. What we like about the Glockenklang pre-amps is the smooth and subtle tone shaping and the Active/Passive treble control. 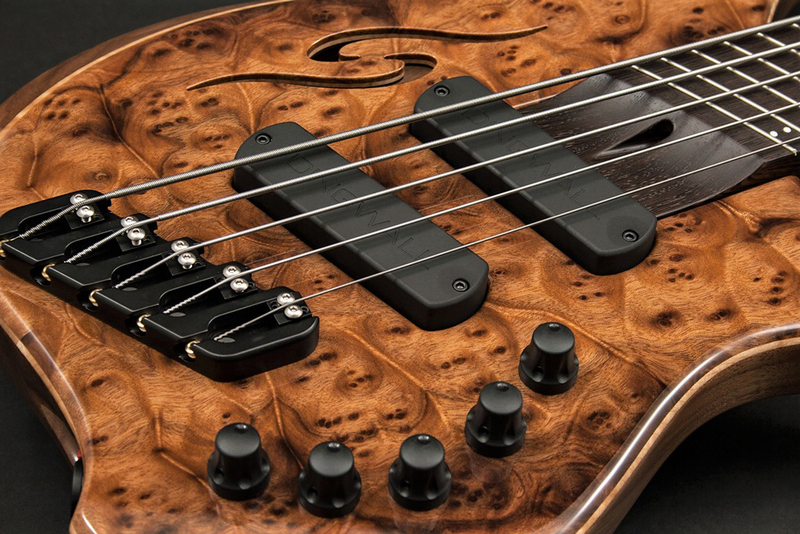 We’ve spent a lot of time perfecting the natural tone of our basses so that they don’t need a lot of tone adjustment. The Glockenklang really fits well with this philosophy. The Active treble boosts and cuts as expected in active mode but when the pre-amp is switched to passive mode, the control is switched to a passive cut control. This is essentially like having two basses with two distinct characters. One active and one passive. Rotary pickup selector. Optional individual series/parallel toggles for each pickup. We looked for years to find a control knob we were happy with. We eventually decided to design and manufacture our own control knobs in house. These knobs are exclusive to Dingwall guitars and feature a sleek design that blends perfectly with the overall design language of our basses and match the pickup shells perfectly. They feature a soft-touch forumla for extra comfort and grip. We use the Neutrik locking jack because it is one of the best output jacks ever made. It is designed for use in studio consoles where reliability is a must. It’s not an easy jack to install in a guitar, therefore you don’t see them often. We take great pride in the way we’ve integrated this jack subtly into our body design. It’s accessible, yet unobtrusive. We’ve tweaked the design of the venerable Hipshot Ultra-lite tuners to make them even lighter. We’ve designed new posts to guide the string toward the headstock face. This allows proper downward angle at the nut for maximum sustain on a flat-style headstock without the use of string trees. Eliminating the string tree reduces the weight of the headstock slightly and improves tuning stability. Designed to be “set & forget” simple as well as featuring a slotted string anchor system for fast and simple string changes. The Afterburner bridge borrows the simple, yet great sounding stainless steel riser screw system used in our high-end bridges. We reduced the complexity of the saddles to a minimum and then designed a unique base plate system to hold them rigidly in place. By using stainless steel riser screws and a tough Teflon coating on the bridge long-term corrosion free performance is ensured.